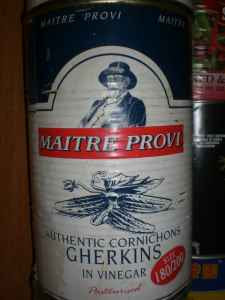 I saw you ad on Craig's List for the authentic cornichons http://newyork.craigslist.org/wch/hsh/1040591184.html . I am obviously very interested, as the price is right, but how can I be assured of their authenticity? In the past I have just taken people's word for it and wound up with just a can of small pickles. Do you have some sort of certificate you scan and send to me?